For a table game that’s remarkably simple to play, roulette has more than its share of lingo. While it’s entirely possible to play without speaking the language of roulette, it's surprisingly simple to become fluent in all aspects of this storied game. 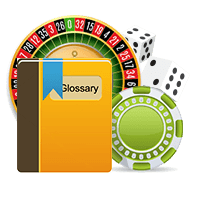 All you have to do is make use of our roulette glossary. We've designed it so you can become fully versed in a matter of minutes. Browse it now and keep it handy whenever you play. There's no easier way to start speaking like a roulette master. Action: The sum of your bets over a set time period. The amount is especially relevant if you take advantage of rewards programs. Action player: Roulette players who frequently place large bets. American roulette: Popular in the USA, this version of roulette uses a wheel featuring a 00 slot in addition to the 0 slot found on European wheels. This gives the house and additional advantage. Ball track: The outside rim of the wheel where the ball spins. This is also known as the backtrack. Bankroll: The quantity of cash you have available to play. This can fluctuate as you win or lose. Basket bet: The strategic bet that covers 00, 0, 1, 2, and 3. Biased numbers: Digits on the wheel that come up more often over time than statistical variance would otherwise allow. Biased wheel: A flawed roulette wheel that doesn't give each number an equal chance of being hit. Big number: A number that comes up more frequently than the odds would otherwise suggest. Black bet: Betting that the ball will land on a black number. Bottom track: The inner sloping region of the roulette wheel. The roulette ball enters the bottom track before it ricochets into the pockets and wheel head. Cage: The location at a live casino where you convert your chips into cash. Call bet: Announcing your bet rather than placing chips on the marked table areas. Only allowed where house rules permit. Carre: Term for the corner bet when playing French roulette. Cheval: Term for a split bet in French roulette. Cold table: Tables where players keep losing. Column bet: A wager that covers a full column of 12 numbers. Colonne: French version of a column bet. Combination bet: Any wager that covers two numbers or more. Comp: Shorthand for complimentary, these are perks and bonuses given out by the casino and can include anything from drinks to accommodations and travel. Corner bet: A wager placed at the intersection of four numbers to cover them all. Courtesy line: An American roulette bet that covers both 0 and 00. Croupier: The dealer who operates the roulette table. This is always a casino employee. Crossroader: A cheater who scams the casino. D’Alembert betting system: The wagering system that required you to up your bet after a loss and reduce your bet by an equal amount when you win. Dead table: A table without players, but is otherwise ready for play. Derniere: The final 12 numbers or 25 through 36 when playing French roulette. Double up betting system: A popular system where you decrease the amount of your wager after a win and increase it by an equal amount after a loss. Double zero roulette: The American rendition of the game with a wheel featuring a 00 slot in addition to the conventional 0 slot. Dozen bet: Identical to the column bet, this wage covers an entire column of 12 numbers. You can wager on 1-12, 13-24, or 25-36. Drop box: The area on the table where you place your cash when purchasing chips. Even bet: Betting that the next number will be even as opposed to odd. Even money bet: Outside wagers that pay 1:1. These include bets on evens, odds, blacks, reds, low numbers, or high numbers. En prison: A special rule that is often available when playing European or French roulette that lets your even money bet remain on the table for the next spin if the ball lands on zero. European roulette: The original version of the game that features 37 numbers, ranging from 0 to 36. This offers better odds than its American counterpart, which adds an extra spot on the wheel in the form of a 00. Fibonacci betting system: A wagering system that's based on repeating combinations of previously successful numbers. Five number bet: Wagering that the next number will be either 0,00,1,2, or 3 when playing American roulette. This is the worst possible bet. Flat Bettor: A person who repeatedly wagers the same amount. French roulette: Similar to European roulette but with an altered table layout and the possible addition of en prison and la partage rules. If you can get over the language barrier, this is the preferred version of the game. Gaffed wheel: An unfair roulette wheel that has been rigged by either the player or the house. Golden numbers: Biased numbers that get hit far more frequently than the probabilities dictate. Grind system: A betting system that requires to increase their bet size following a win. Heat: Garnering the attention of management after significant success at the tables. High bet: A wager on the numbers between 19 and 36 that pays 1:1. High roller: A gambler who bets big and often. Hot table: A roulette or other gaming table where the players win more frequently than the house. House edge: The statistical advantage that the casino has over players. Inside bet: Wagers placed on the numbered area of the table. La boule: A simplified version of roulette that used to be popular in France. Players can bet on nine numbers and three colours. La partage: A special rule that is occasionally offered when playing French or European roulette that returns half of your losing even money bet to you if the ball lands on zero. Les Orphelins: A roulette racetrack bet that covers the first third of the wheel. Layout: The arrangement and marking that are painted on the felt surface. This can vary depending on whether you play American, European, or French roulette. Line bet: Also known as the six line bet, six number bet, or avenue bet, this wager covers two adjacent rows and six numbers in total. Low bet: A wager on the numbers between 1 and 18 that pays 1:1. Low roller: A gambler who exclusively places small bets. Martingale betting system: The popular gambling system where players double their wager following a loss. Money at risk: The total quantity of cash that is bet during a spin. Negative progression: Increasing wagers after losing. Odd bet: Betting that the next number will be odd as opposed to even. This pays 1:1. Odds: The likelihood of a particular outcome. Outside bet: Bets placed on the outside area of the felt. These include red, black, even, odd, low, high, columns, and dozens. Paddle: The tool that the croupier utilises to push cash into the drop box. Parlay: Doubling your wager following a win. Past posting: An illegal move where a player sneaks in a bet after the winning number is known. Pinching: Stealing back chips from the table after the winning number is known. Positive Progression: Increasing your wager after winning. Press: Raising your betting amounts following a win or series of wins. Push: A tie where your cash is returned to you. Quarter bet: Wagering that the ball will land on one of your four numbers. Also known as a square bet or corner bet. Rating: The process where casinos appraise players for the purpose of granting comps. Racetrack: A special betting area on the table where the numbers are arranged in the order they appear on the wheel rather than sequentially. Red bet: Wagering that the ball will land on a red number. This pays 1:1. RFB: Industry lingo that stands for free room, food, and beverage. Scared money: Players who bet money that they can't afford to lose. Section shooter: A croupier who aims to hit the same area of the wheel on repeated spins. Section slicing: Cutting up the wheel into sections based on hotness. This can help you spot bias in the wheel. Session: The amount of time spent playing. Shill: A casino confederate who plays to encourage others to gamble. Single zero roulette: The European version of the game that features 37 slots, ranging from 0-36. Split bet: Wagering on two numbers that are next to one another on the table. Straight up bet: Wagering on a single number. Street bet: Wager that ball will land on one of three numbers. Surrender: The special rule that dictates players will get half their bet back if the wheel lands on 00 or 0. Tiers du Cylindre: A roulette racetrack bet that covers the second third of the wheel. Trio: Also known as the street bet, this is a wager on one of three numbers. True odds: The statistical likelihood of a specific outcome. Visual wheel tracking: Being able to predict where the ball will land by following the wheel and ball. Voisins du Zero: A racetrack bet that covers the final third of the roulette wheel. Wager: Used interchangeably with the word bet. Wheel: Shorthand for the roulette wheel. Wheel head: The area of the roulette wheel that houses the numerical pockets.